Jacob went on his way, and the angels of God met him. 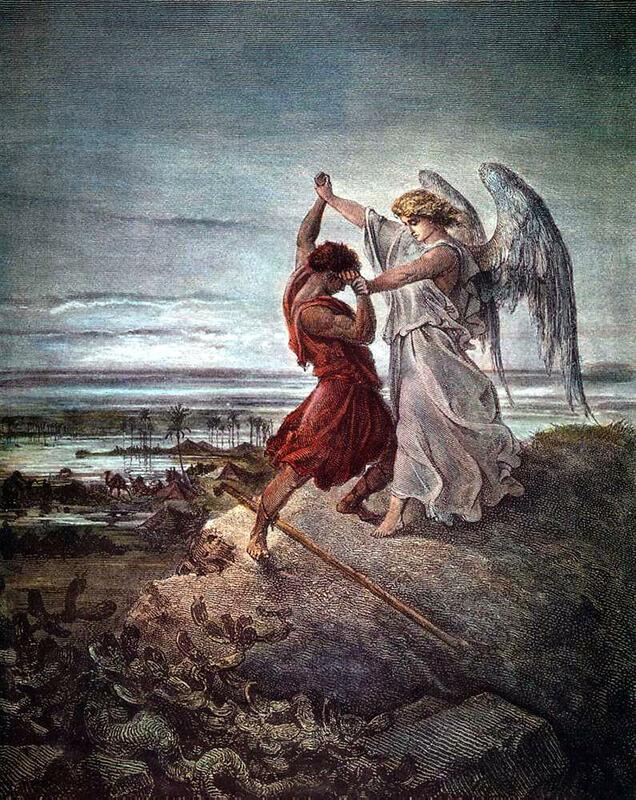 The purpose of their visit is not explained, but Jacob was encouraged by their presence, and probably needed to be so after his confrontation with Laban. And when Jacob saw them he said, “This is God’s camp!” Excited to be blessed. So he called the name of that place Mahanaim. And Jacob sent messengers before him to Esau his brother in the land of Seir, the country of Edom, Jacob wanted his presence annouced so Esau would not think he came in hositility; It was also a matter of respect as Edom was Esau’s land and people instructing them, “Thus you shall say to my lord Esau: Jacob humbles himself by calling Esau his lord Thus says your servant Jacob, ‘I have sojourned with Laban and stayed until now. For twenty years I have oxen, donkeys, flocks, male servants, and female servants. Jacob needed nothing from Esau, but mercy and forgiveness. I have sent to tell my lord, in order that I may find favor in your sight.’” That he may demonstrate his worth; that he is not there to take from Esau or trick him. And the messengers returned to Jacob, saying, “We came to your brother Esau, and he is coming to meet you, and there are four hundred men with him.” Jacob did not know the intent of Esau. This was a man he cheated. Jacob stole his birthright and blessing, and now Esau approached him with 400 men! Then Jacob was greatly afraid and distressed. He had fled because Esau sought his life. Our fear drives us toward the shelter of Christ. He divided the people who were with him, and the flocks and herds and camels, into two camps, thinking, “If Esau comes to the one camp and attacks it, then the camp that is left will escape.” Jacob was uncertain, but feared the worst. Esau was a huntsman, a warrior. Jacob was a timid, quiet man. His action here is prudent, but is not fully relying on God. And Jacob said, “O God of my father Abraham and God of my father Isaac, Cast all your anxieties and cares upon the Lord (Psalm 55:22, 1Peter 5:7) God had Jacob where He wants him to be: dependent on Him. O Lord who said to me, ‘Return to your country and to your kindred, that I may do you good,’ He reminds God of his promise I am not worthy of the least of all the deeds of steadfast love and all the faithfulness that you have shown to your servant We all fall short of God’s glory, which is why we need Jesus. We should humble ourselves as Jacob, before our God. Please deliver me from the hand of my brother, from the hand of Esau, for I fear him For Jacob this was a very real fear, grown in the guilt of his own heart. So he stayed there that night, and from what he had with him he took a present for his brother Esau To appeal to Esau for peace, mercy When Esau my brother meets you… then you shall say, ‘They belong to your servant Jacob. They are a present sent to my lord Esau. Jacob sends a humble message to Esau, with an appeasement of gifts, that he not have to suffer for his wrong done to Esau. We approach our God through Jesus Christ, who suffered upon the cross for our sins, that we can escape our rightful judgment, and have eternal life. And Jacob was left alone. And a man wrestled with him until the breaking of the day. Someone in the form of a man wrestled with Jacob; some say it was Christ, who is God in human form, others say it was an angel of the Lord. It is clear however, that it is not only a physical event, but a wrestling of Jacob’s spirit against the will of God. When the man saw that he did not prevail against Jacob, he touched his hip socket, and Jacob’s hip was put out of joint as he wrestled with him. Jacob’s spirit and fear were stubborn, but God found a way to make him submit. Notice just a touch from God and Jacob’s hip is out of joint. The wrestling could have ended at anytime with such a touch, but Jacob needed to learn the exhaustion of wrestling with God. We should readily submit to His will. Then he said, “Let me go, for the day has broken.” It was an appointed time. But Jacob said, “I will not let you go unless you bless me.” Jacob recognized the divinity of whom he wrestled with. And he said to him, “What is your name?” Admit to me what you identify yourself with. Confess to me your name; What is in your heart? And he said, “Jacob.” Jacob: a cheater, a deceiver, a supplanter, a liar, an usurper. I took my brother’s birthright. I lied to my father. I stole the blessing meant for my brother. I am a sinner. Then he said, “Your name shall no longer be called Jacob, but Israel, meaning “struggled with God”; for you have striven with God and with men, and have prevailed. ” renewed in God, cleansed by Christ , you will no longer be the deciever; Jacob did not prevail as in defeating the man he wrestled, but in his submission to God. Our weakness and need of God is our strength, and by it we will prevail Then Jacob asked him, “Please tell me your name.” Saul, after being knocked from his horse in the bright light asked, “Who are you Lord?” Who is it that brings us to our knees, that we may know Him? But he said, “Why is it that you ask my name?” When Philip asked Jesus to show him the father, and Jesus responds, “Do you not know me, Phillip?” And there he blessed him. The true divine blessing, not the one stolen from Esau. So Jacob called the name of the place Peniel, “face of God” saying, “For I have seen God face to face, and yet my life has been delivered. God revealed himself to Jacob in a form Jacob could withstand; He delivered Jacob from Jacob’s own will, and gave him shelter in His Will. The sun rose upon him as he passed Penuel, limping because of his hip. A permanent reminder of the incident.